Sometimes, it just takes a small glimpse of kindness to give us hope. What better glimpse than a photo worth a thousand words. 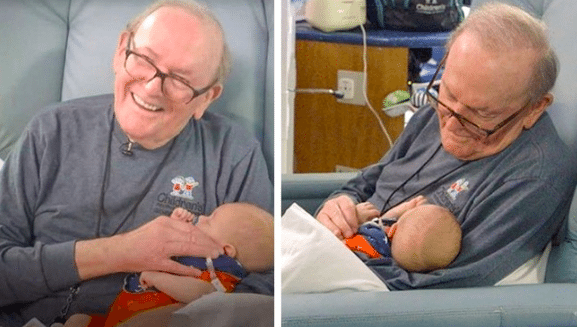 These remarkable 50+ photos will restore your faith in humanity and remind you how powerful small acts of kindness really are. New York-based hair stylist Mark Bustos dedicates his time to giving free haircuts to homeless people all over the world. He has visited the streets of California, the Philippines, and England. The woman in the photo is paralyzed from the waist down and the stream below them is sewage. An adorable photo of a dog can help it to get adopted better. 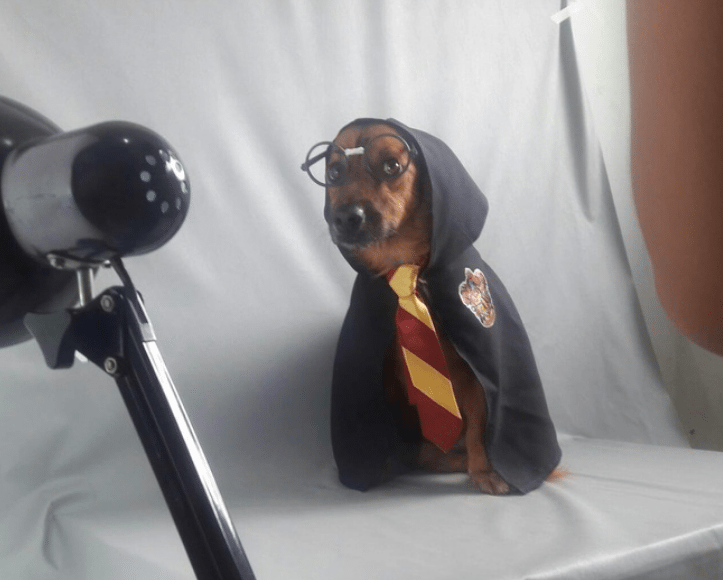 This woman helps dogs to look their best. Then she uses her photography skills to capture how adorable they truly are. When a student brings her baby to her college class, the little one begins to cry. 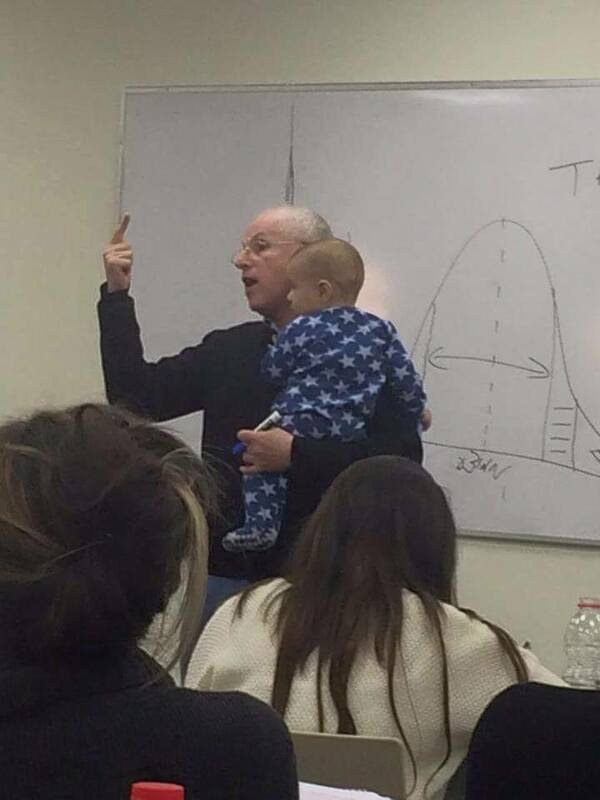 Without hesitation her professor brings the baby to the front of the class. There, he nonchalantly continues teaching. This poor woman had no choice but to face the rain. But the man understood that he did have a choice. He held the umbrella for her when she couldn’t. 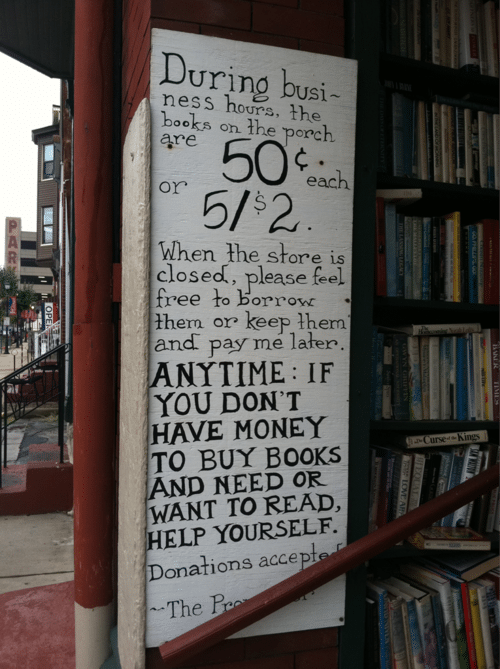 This bookstore owner wanted to make sure that everyone who wants to read could. Even if they didn’t have the money to buy a book, they were allowed to borrow or even take books. That’s one way of promoting literacy. At this dry cleaning service, they understand that you can’t get a job if you don’t look presentable. They offer free dry cleaning to people who want to have a clean suit, but can’t afford to get it cleaned. Thinking that the next person who came into the restroom was going to be disappointed, this person left a signal to them. 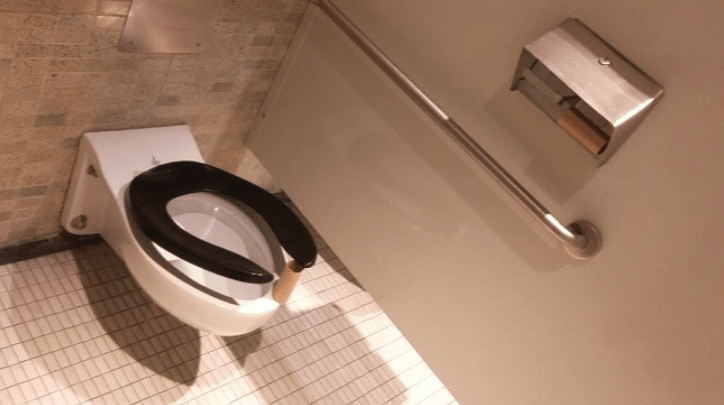 They kindly let the next user know that the stall was out of toilet paper. How thoughtful! They are truly an example of someone who does what is right even when no one is looking. IHOP server Joe Thomas knew husband and wife regulars. He also knew that the wife had Huntington disease and that her husband fed her before he ate his own meal. He gave them the chance to eat together for once by feeding the wife himself. At just six years old, this sweet little girl understands kindness. 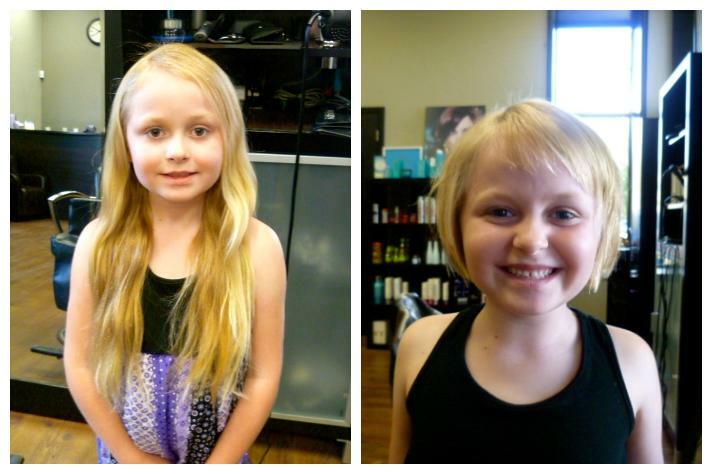 She donated a whopping 13 inches of her hair. It will go to make wigs for cancer patients. 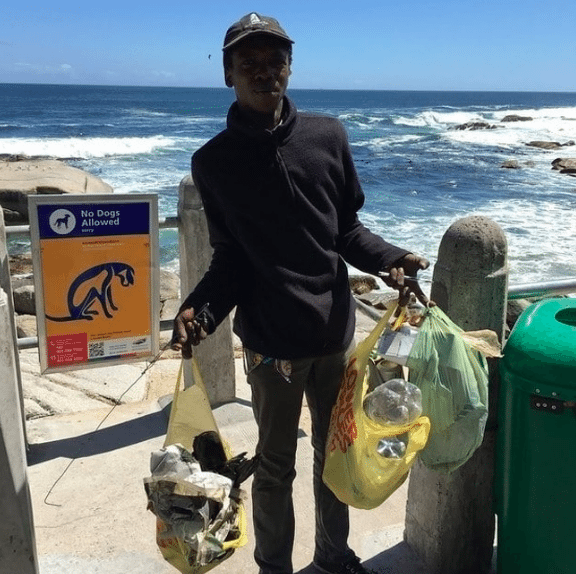 This man voluntarily cleans up the beach. He says he just wants it to look nice for tourists and everyone. No one asked him to, he just takes pride in keeping the Earth beautiful. 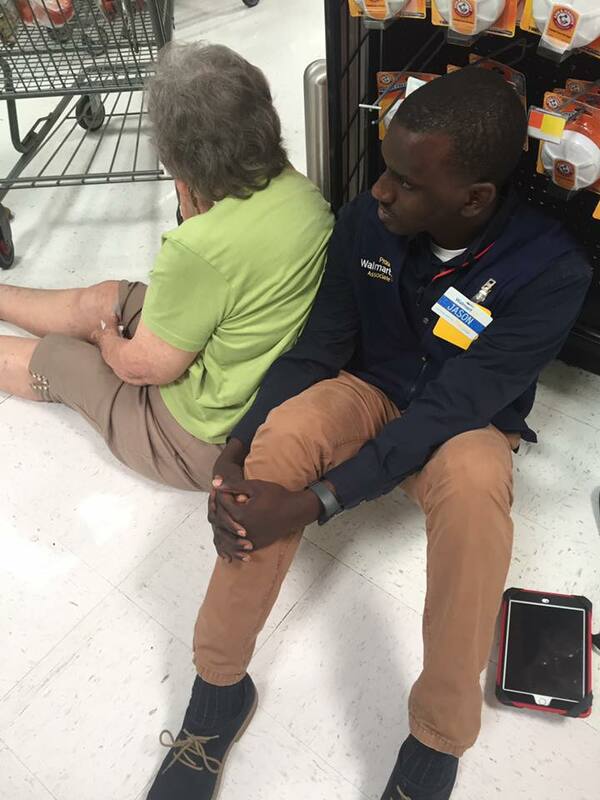 When a woman passed out on the floor of his Wal-Mart store, this manager didn’t think twice. He sat down in the floor and let her lean against him until help arrived. Not only did she have his back to lean against, but she didn’t have to feel so alone there on the floor, either. When young patients from a local hospital get to go onto the field, fans make the moment even more memorable. 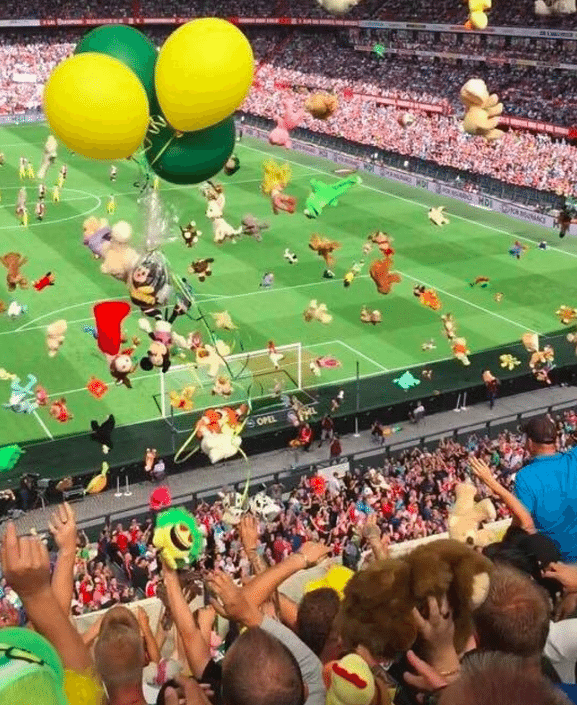 They throw toys down onto the field to the children. 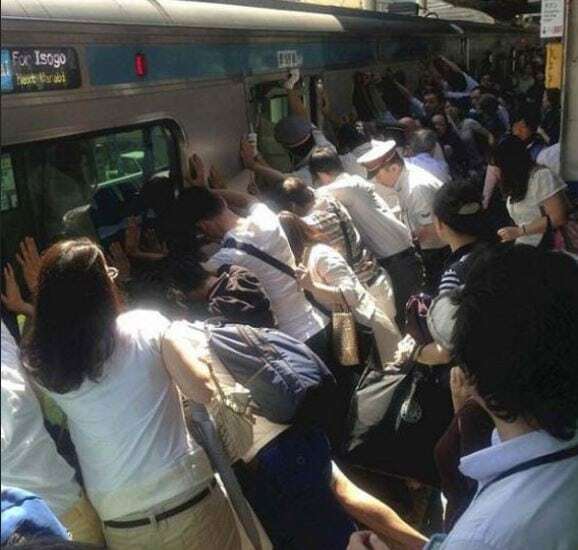 Can you imagine the looks on their faces? 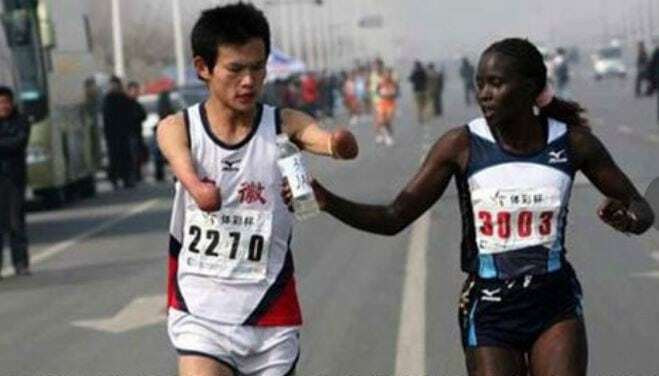 It didn’t matter to this world-class runner that she had to slow down in order to help this man. She gladly helped him get a drink. That’s what makes her a winner. Not willing to see himself as a victim, this Syrian refugee simply wanted to give something back. 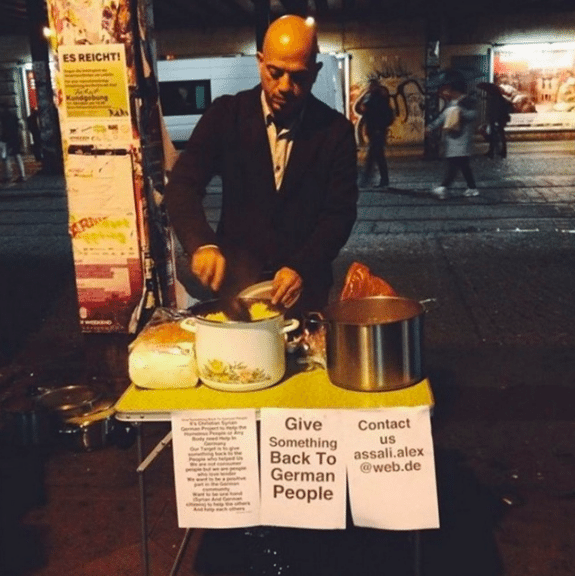 He made free meals for the homeless. He chose to be thankful for what he had been given and to share what he had. Among the 35 photos that restore faith in humanity is one teacher who believed in something better. 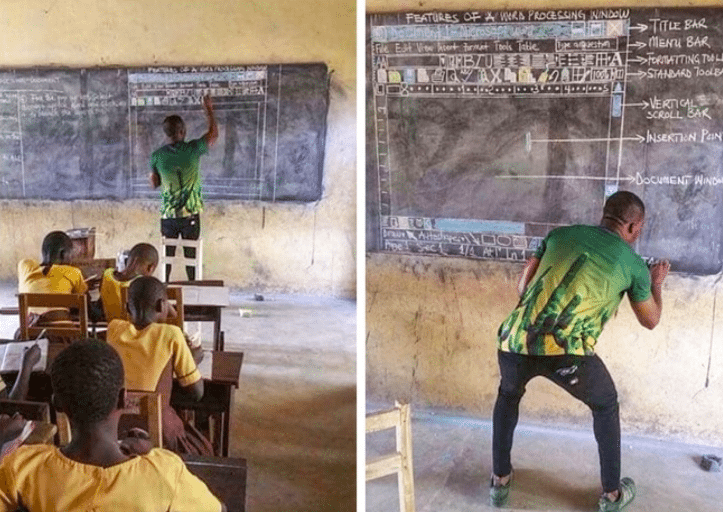 Even though his students didn’t have computers, he still believed they deserved the same opportunites that other kids had. He taught them to use Word, no mater how hard it was. Instead of going out with friends or enjoying a quiet lunch in solitude, one co-worker spent his one hour a day on a much more meaningful pursuit. 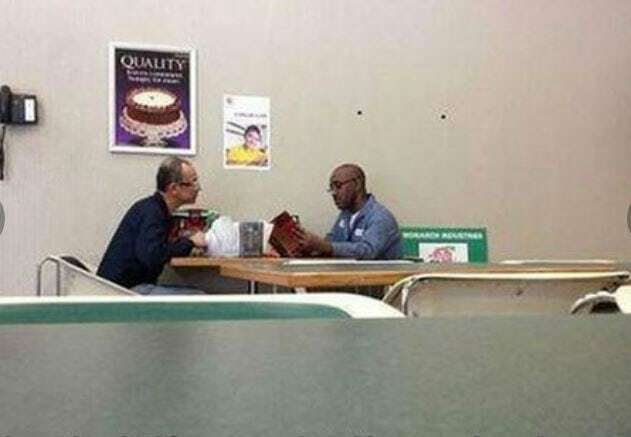 His fellow co-worker couldn’t read, so this man read to him each day during their lunch hour. When an act of kindness enters our mind, nothing should be able to stop us from following through with it. 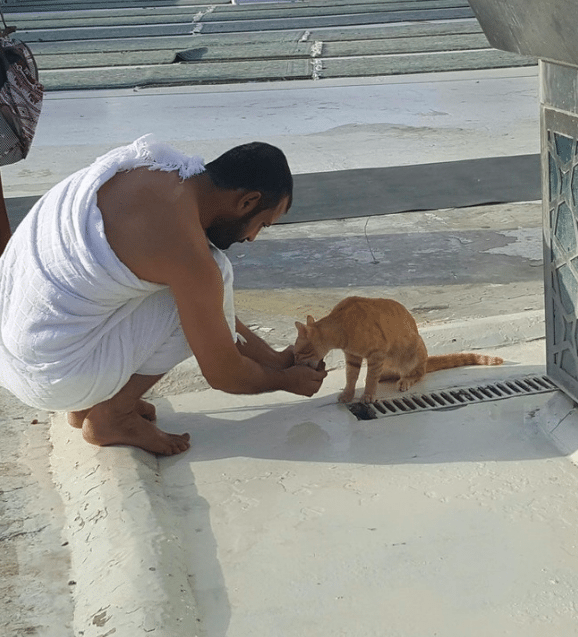 This man in Mecca couldn’t find a cup to feed this cat. He just fed it out of his own hands. Seeing a girl with no shoes spurred this man into action. He gave her his own shoes right off of his feet. His kindness touched her as she covers her face. This woman understood what her true job was for the day. Today, she wasn’t just a cashier. Her most important job was to help the man in need to get up the steps of the restaurant. She stopped working to help him. 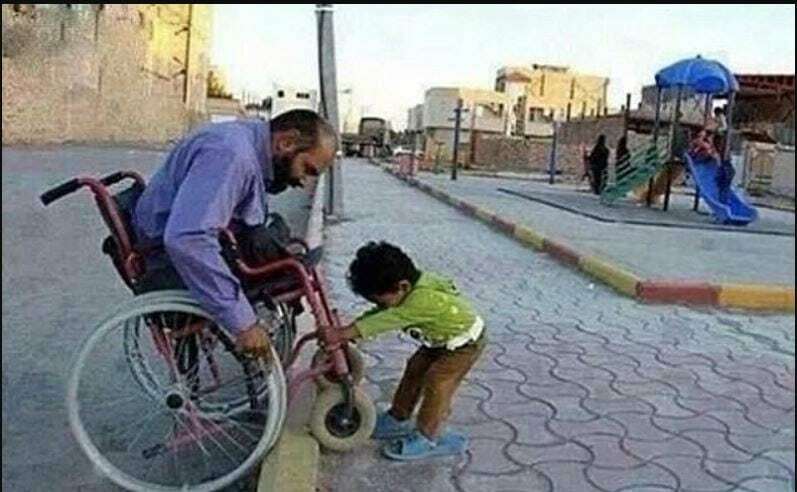 A big heart wrapped in a small package, this tiny child tries to help a man in a wheelchair over a bump in the road. This photo truly proves that it is not the size of your muscles that matter, but the size of your heart that counts. 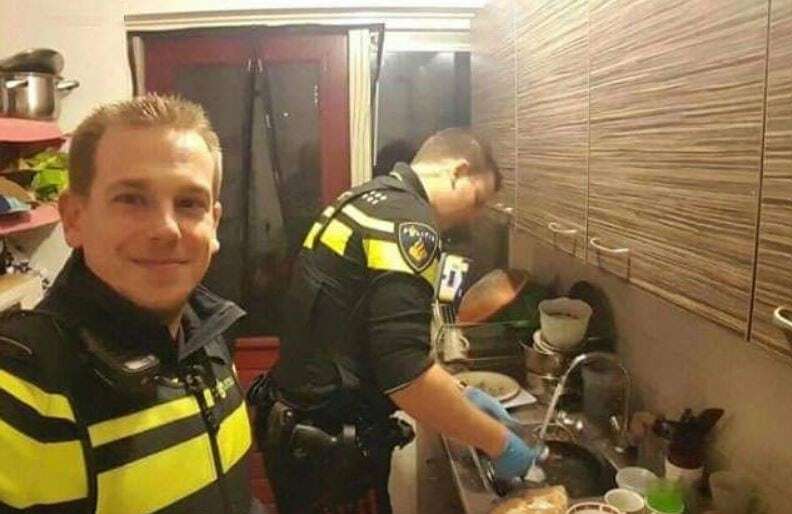 These officers from the Netherlands went above and beyond the call of duty. After a mother was taken to the hospital, they stay behind and do her dishes and cook dinner for her five children. Taking hours out of his day, this man drove into the wild lands of Kenya. Every day, he brought water to the animals during a drought. 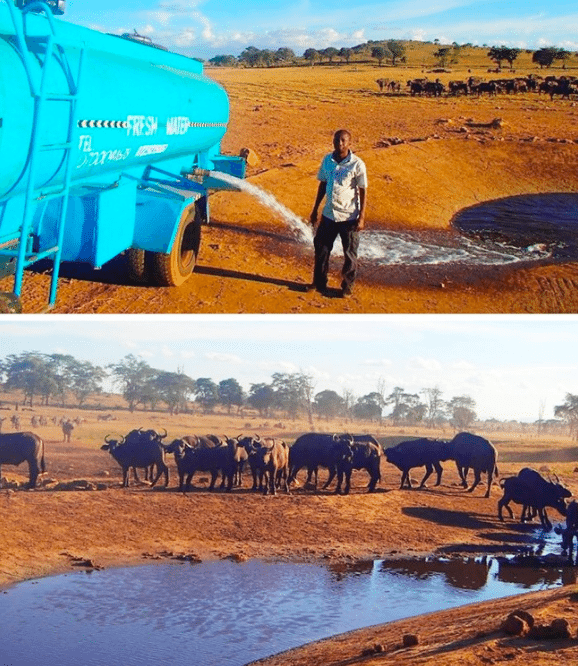 He brought 3,000 gallons of water to animals that would otherwise die. When he found $5,000 in a dicarded refrigerator, this man could have just kept it. But his heart led him to find it’s owner. 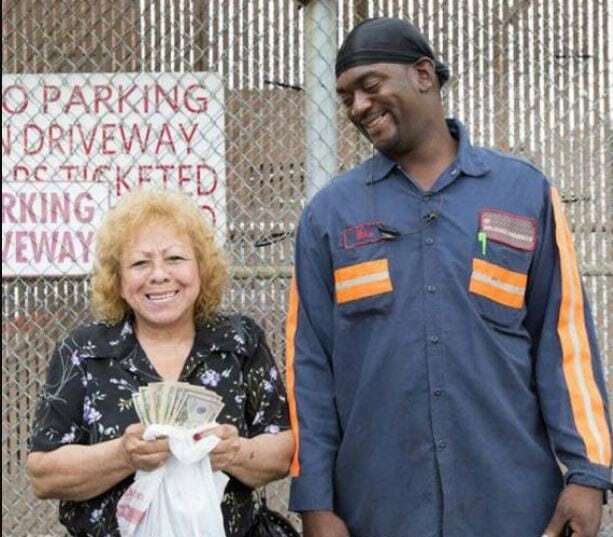 He returned the money to the woman that had been saving it for so long. When this autistic boy couldn’t overcome his fear of haircuts, this barber got on his level. Literally. He cut the boy’s hair in the floor while the child played games on a phone. These police officers could have just looked the other way. Instead, they bought lunch for a mentally handicaped person that they just met. 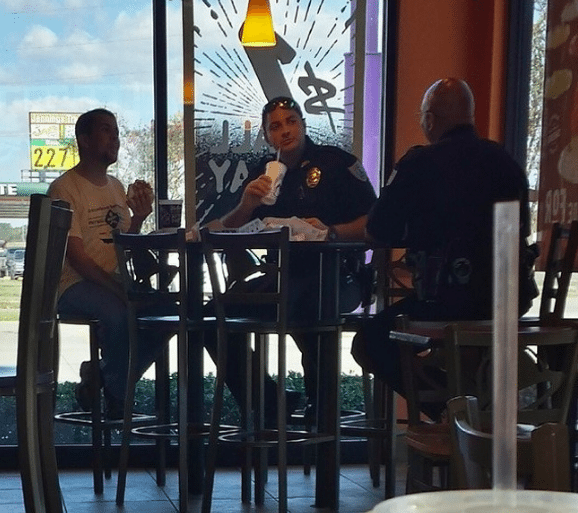 They even sat down to eat with him. Seeing a thirsty dog, this toddler knew just what to do. They walked over to the fountain and pushed they button. 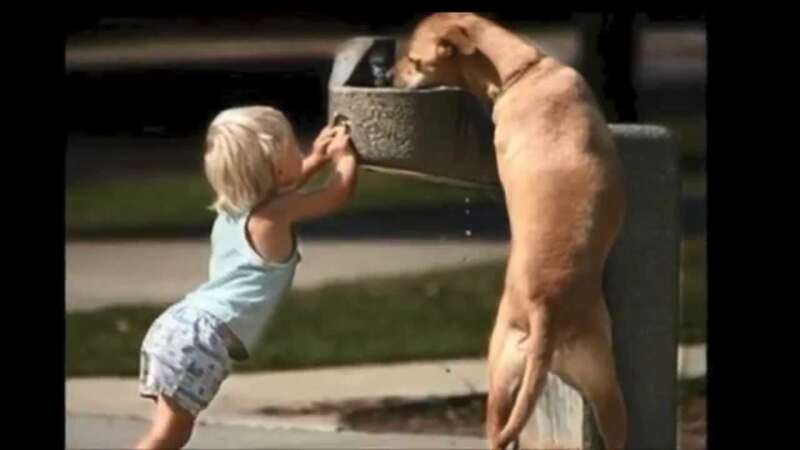 The dog drank from the fountain as the two made a priceless picture of kindness. 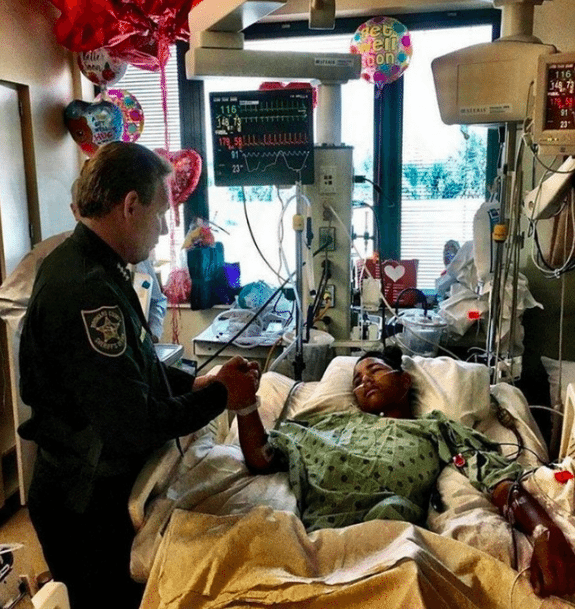 This boy bravely chose to protect his fellow students from gunfire no matter the cost. He used his own body to hold the classroom door shut. His act saved 20 of his classmates. 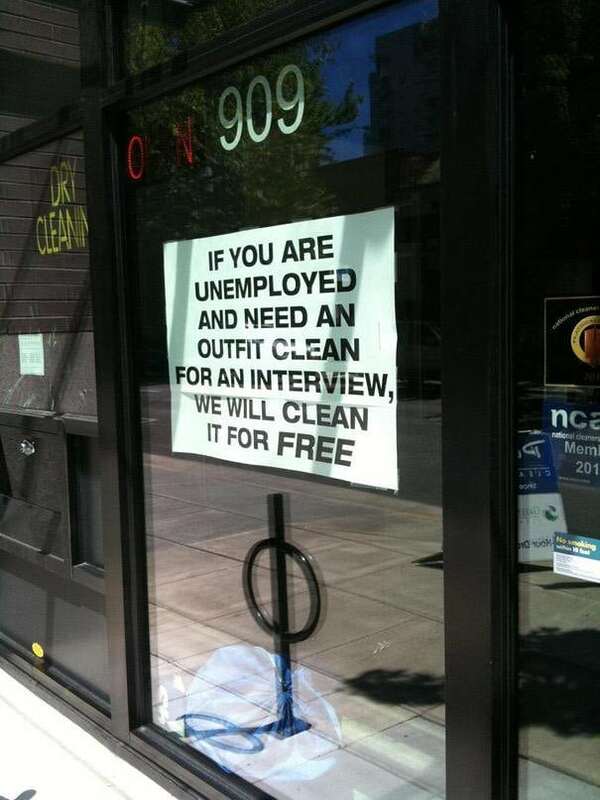 One store owner thought of a way to help others. 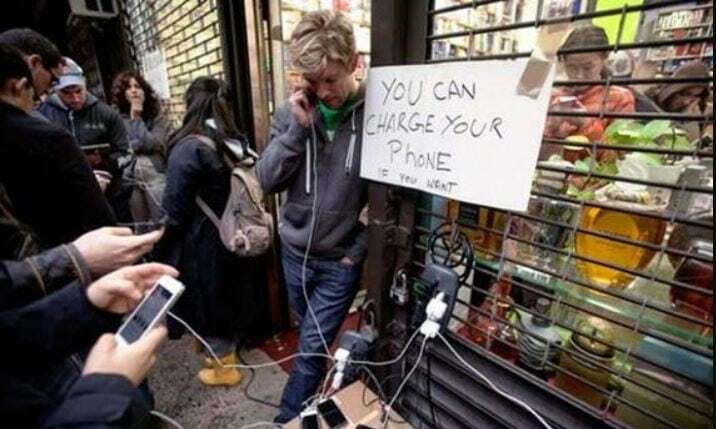 During hurricane Sandy, he opened his doors to anyone needing to charge their cellphones. He let them use his power to charge their phones so they could stay in touch with worried loved ones. 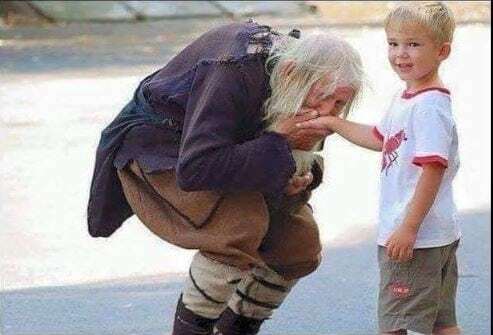 In Bulgaria, this 101-year-old man proves it’s never too late to show kindness. 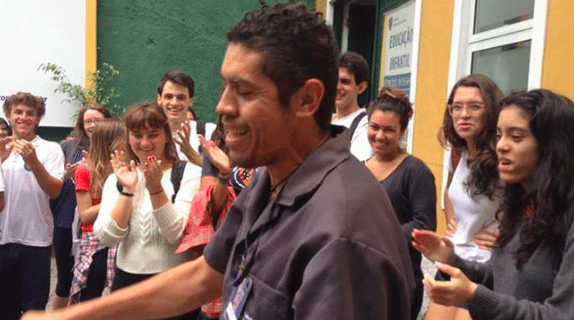 He walked 15 miles every day to beg money for orphanages that couldn’t pay their bills. He did this for 16 years. Among these 35 photos that restore your faith in humanity, is the unforgettable image of a very special wheelchair. 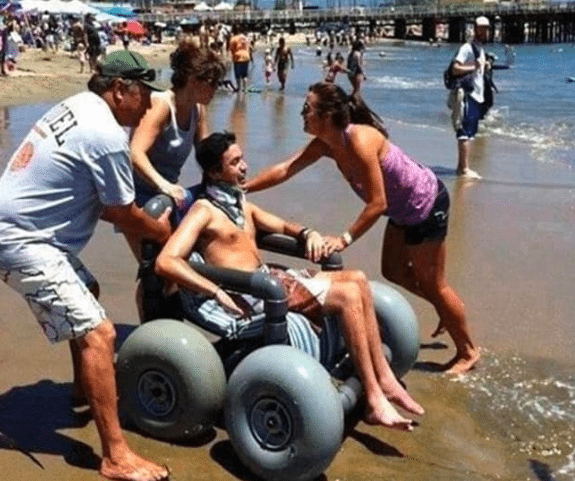 This boy wanted to visit the ocean up close and his family help his dream come true. These students wanted to pay back the kindness shown to them by their teacher. They got together to give him a very special gift. He received tickets to see his favorite band. 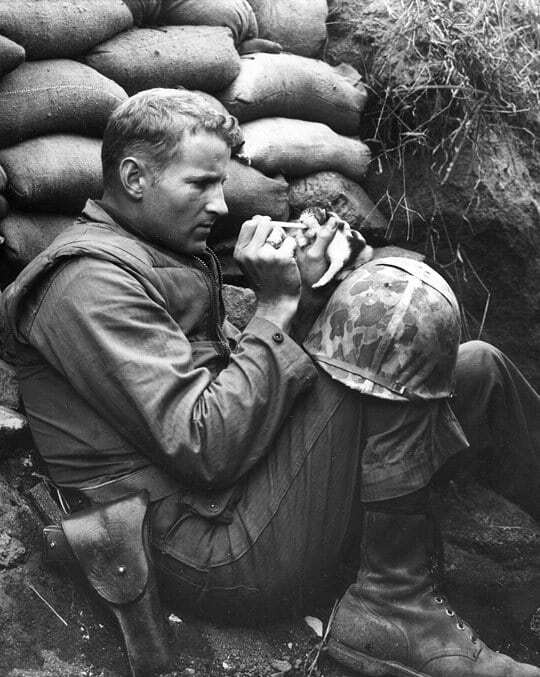 In the midst of war, one soldier reminds us what truly matters. He takes a moment to feed a hungry, lost kitten, saving it’s life. 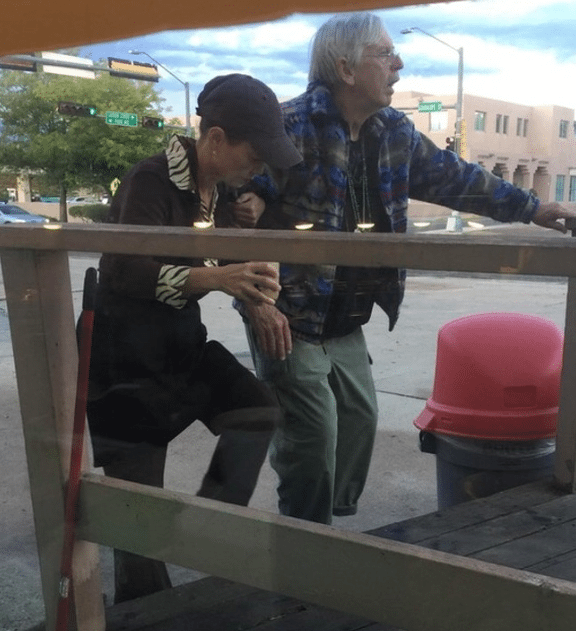 This elderly man has learned that sometimes, you just need someone to be there with you. He visits the ICU in Atlanta. He holds the babies just to let them know someone is there. 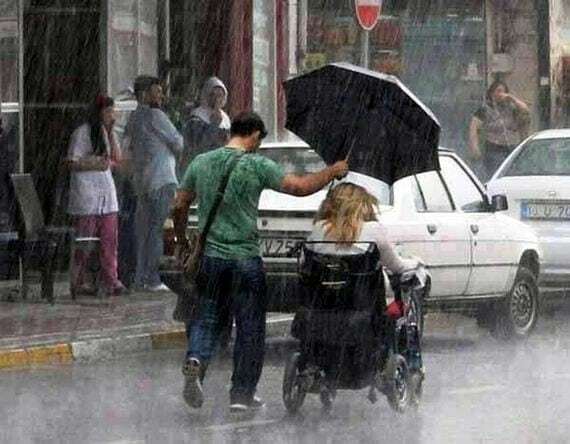 It is often the smallest acts of kindness that have the most significant impact on the world. This man simply stands with a sign that says “Free Hugs.” He understands that a little love goes a long way in changing the entire world. Kindness has a way of spreading. What you may perceive as insignificant could spread to include many. It all starts with one simple act of kindness toward another to restore someone’s faith in humanity. And it could start with you. While this baby’s mom was being treated by paramedics, the baby started fussing. 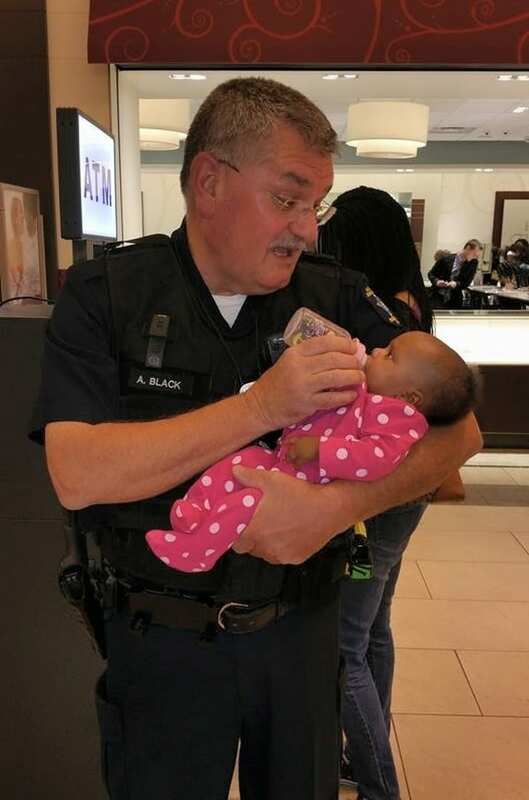 A police officer who was at the scene offered to feed the baby, and he picked the little one up and carefully held her. The baby’s mom was so grateful that someone was looking out for her bundle of joy—she was able to focus on getting better. When a dad admitted to his daughter that he didn’t have a lot of money that week, the little girl didn’t say much. Because of that, the dad wasn’t sure she understood what he meant. 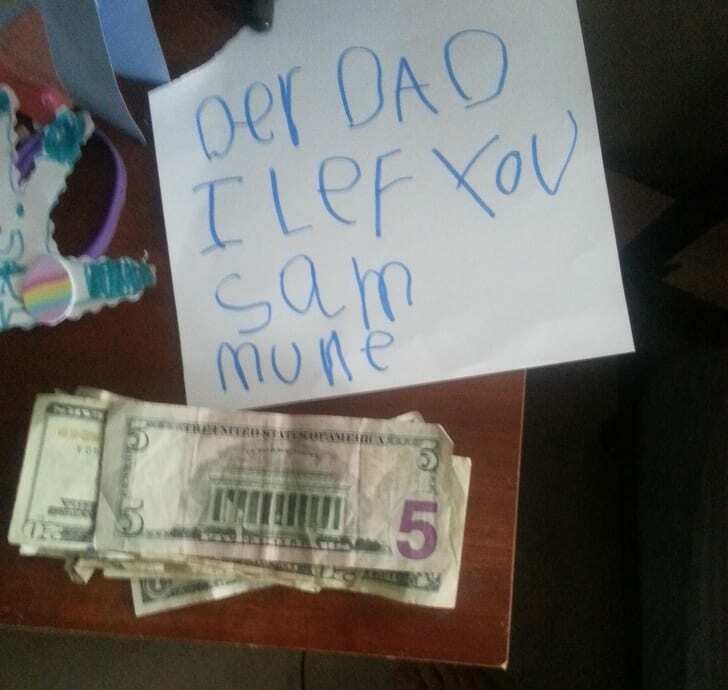 But then, the dad went for a nap, and when he woke up, he found this note waiting for him. The dad’s heart melted—he couldn’t believe his daughter would do something like this for him! This elderly woman loves going to her local supermarket and reading books. 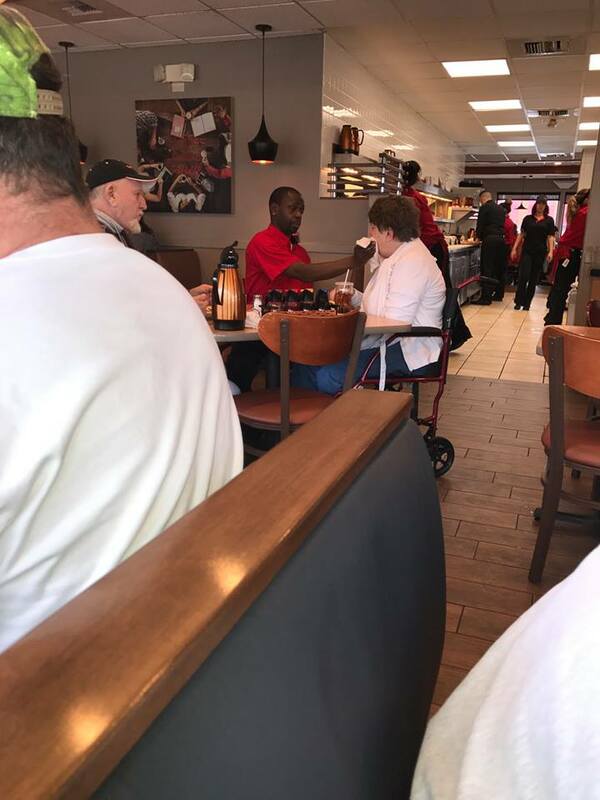 The manager noticed how often she was coming in, and instead of getting mad about the fact that she never bought anything, he decided to do something kind for her. He set up a bench in the aisle so the woman could be more comfortable as she read. The elderly woman was so touched!